Elisa on a timeless, elegant and somewhat underrated chypre. A green chypre can feel golden and warm, like the opulent Safari by Dominique Ropion, or chilly and aloof with iris, such as the archetypal Chanel No. 19 and Paco Rabanne Metal. I associate the warm, galbanum-dense chypres with autumn, while I always seem to reach for cool chypres like Metal in spring. YSL’s Y, released in 1964, is immediately recognizable as a green chypre, but has a different feel from others in this family. To me, it’s a summer chypre, with the same aspirational mansion-in-the-Hamptons air as Estee Lauder White Linen. When I play tennis, I do it on free courts, not in backyards, but either way, this seems like the perfect perfume for a doubles match, especially if you’re wearing a skirt. If you prefer to watch from the lawn with a glass of white wine, it would be lovely for that too. There’s a twenty-year-old ad for Yves Saint Laurent Paris that says everything you need to know about this iconic fragrance. In the ad, the model Lucie de la Falaise leans against a wall while holding a huge bouquet of light-pink roses. 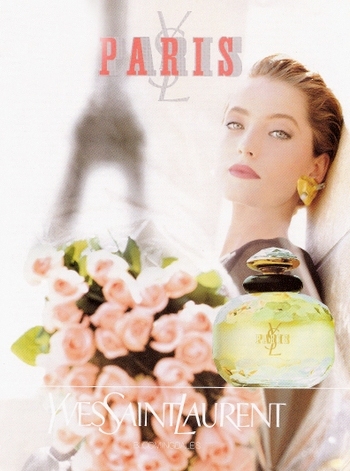 Everything but the model’s face and the bottle of perfume is in gauzy soft focus, including in the background the Eiffel Tower. De la Falaise looks otherworldly in this city of muted pinks and greens, serene, elegant, and very, very French. Surely the City of Light is scented exactly like this, is it not? Isn’t Paris a veritable rose macaroon, tinted pink as Yves Saint Laurent’s fantasy fragrance is? 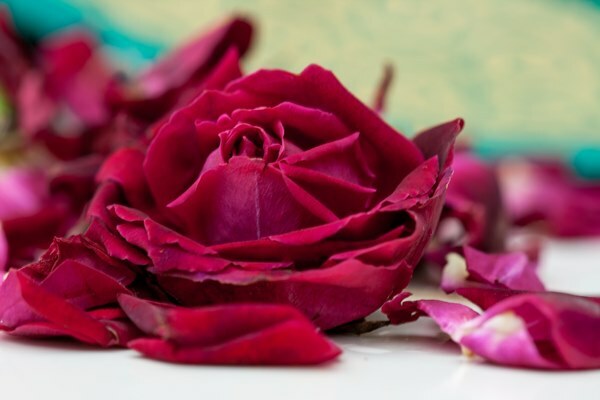 Paris is an ebullient and romantic daydream of a scent that interlocks a fruity, jammy, and abstract rose with violets that smell the way candied violets look. One spray and (nearly) all is revealed. This is not a perfume of special effects but one that opens big, stays big, and gives you a bit of sandalwood as a basenote souvenir. Take Thierry Mugler Angel and dilute it with sheer, lemony jasmine till all you have left are the pastel colored outlines of the original gourmand patchouli. Shake it up, label Yves Saint Laurent, and you have Manifesto! I complained that Lancôme La Vie Est Belle is unexciting, but next to Manifesto it’s downright avant-garde. My qualm with Manifesto is not that it’s a bad perfume, but that it doesn’t have much character. Smell it once, smell it ten times, I guarantee that you won’t remember it. Of course, not every single fragrance needs to make a statement–mild, unobtrusive blends do have their place, but Manifesto could be inside any bottle: the latest celebrity launch, Escada, Calvin Klein, Coty, Avon or even Bath and Body Works. It’s not entirely clear what makes this perfume Yves Saint Laurent. It doesn’t have the bravura of Opium nor the voluptuous beauty of Paris. It lacks the sensuality of Cinéma or the moodiness of Nu. It smells trendy, like a scent you’ve noticed many times before at the mall or inside a crowded subway car–a cotton candy laced patchouli, with a soft blur of flowers.